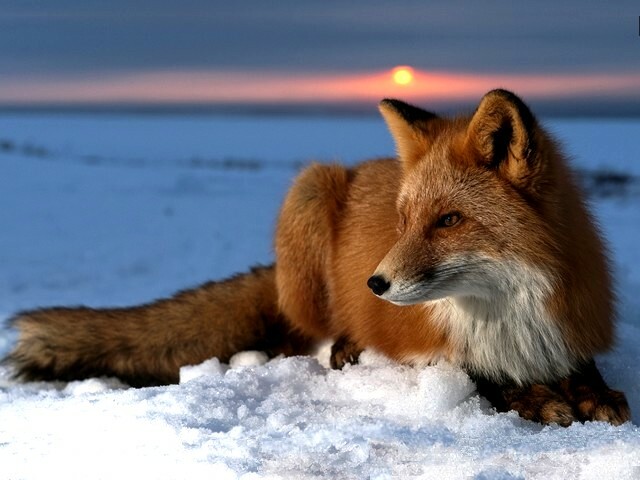 A handsome red fox (Vulpes vulpes) on the snow at an arctic tundra of Alaska. This carnivore is an almost cosmopolitan animal, a cousin to the dog and the largest among the foxes, distributed across the entire Northern Hemisphere from the Arctic Circle to North Africa, Central America and even in Asia and Australia. The red foxes are shy, secretive and cunning nocturnal animals, solitary hunters who feed on rodents, rabbits, birds, and other small game, fruit and vegetables, fish, frogs, and even worms. Theirs thick tail is used as a warm cover in cold weather and for balance.